At the start of the Twentieth Century the various County Bowling Associations were in their infancy. The Gloucestershire Bowling Association was formed in 1905, and Somerset Bowling Association not until 1914, from 15 clubs. It appears at this time that Bristol-based clubs north of the River Avon - the boundary between Somerset and Gloucestershire - had not allied themselves to their natural county, and were by exception welcomed into the burgeoning Somerset County Association. Bristol Arrow BC was one of the first to become affiliated in this respect. 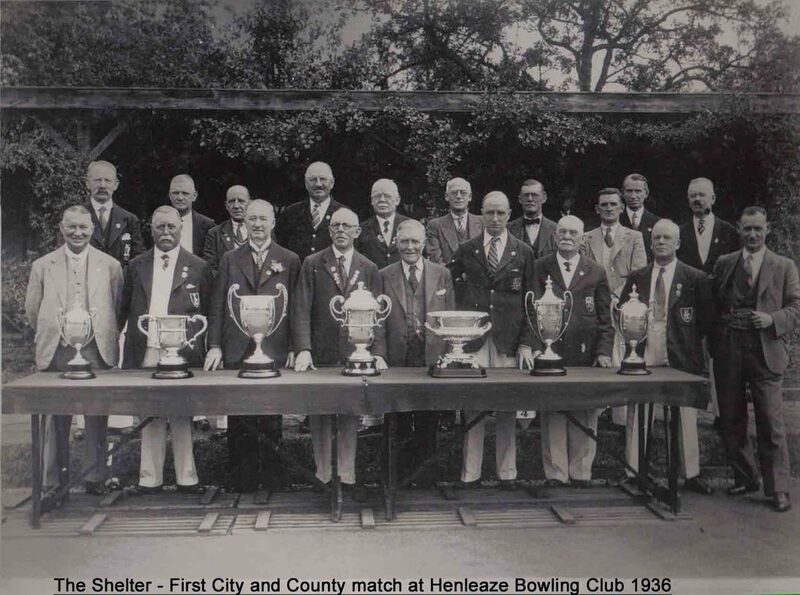 Henleaze BC joined in 1929, and Bristol St George BC followed in 1930. The influence of all the Bristol Clubs within the Somerset BA was therefore becoming significant. Eventually a well publicized champagne, led by Mr. E.M. Trevor resulted in this matter being thoroughly aired. By the end of 1935 the position of the Gloucestershire-based clubs was seen by some of the Somerset officers as being anachronistic, prompting a move to exclude those clubs from the Association. At the AGM held at the Victoria Club, Weston-Super-Mare on November 23rd, Dr R Scott-Reid of Bloomfield BC put forward the resolution that Rule 3 "…be altered to read as follows:- Membership of the Association shall be open to all bona-fide Amateur Bowling Clubs, and shall be confined to clubs whose greens are geographically situated in the County of Somerset." The debate which followed this had some singular features. An objection by J.J. Armer (Bristol St Andrews BC) that this should have been first considered, and therefore possibly suppressed, by the Executive Committee, was rejected, but the next concern raised a few eyebrows. "Mr Porter (Bristol Civil Service) strongly criticised the fact that a circular letter, signed by the President himself, had been issued suggesting that clubs should send strong representation to the meeting and stating that he the President) was in favour of the motion. Was it the right procedure, he asked, for the gentleman who was to preside over the meeting to inform the delegates that he favoured the motion? The president replied that as a Somerset man he had felt it right that he should issue and sign the letter, which had been forwarded to all clubs. A Bristol delegate asked why his club had not received a copy of the letter. He was followed by other Bristol club representatives who similarly protested that no letter of the kind had reached them. The President could only state that he had given orders for the letter to be sent to all clubs." Dr Scott-Reid then proposed the motion, and referred to "trouble and grousing which prevailed in the county was due to a complete absence of unity and the proper county spirit". He then went on to say that "To 75 per cent of the members Somerset was a mere nothing, only a means to an end, and when once the "county coat" had been won all interest ceased." Mr Reakes (Wells BC) seconded the motion and went on to say that "The Somerset clubs were being effaced by the strong infusion of players from Bristol." The vote was taken, and defeated by 118-133. Mr Trevor was then proposed for re-election as President, but declined because of the defeated motion, and further nominations of George Sutton and W.A. Price were also declined. The issue was clearly an emotive one and would not go away. The AGM was adjourned until January when the outstanding items on the agenda could be completed. At the Henleaze BC Annual Dinner, the club's President, Clarence Davey, then referred to remarks by Mr Trevor that "the county did not want the 22 clubs on the Gloucestershire side of the Avon" and on another occasion that "had our Bristol friends been real sportsmen they would never had opposed the motion". The report goes on to quote Clarence Davey as saying "Bristol clubs have for many years cherished a hope, perhaps secretly, that at some time or other it may be possible to have a Bristol County Association". The Adjourned AGM reconvened in Weston-Super-Mare. Mr Trevor had relented and agreed to stand for re-election and was duly accepted. The business continued with election of other officers and delegates, arrangements for competitions and county matches, and the problems of selection for County matches with too few nominations being put forward. It was under Any Other Business that the geographical split then came to the fore again. Mr Reakes (Wells BC) asserted that "a few weeks ago, the secretary of the Wells club had forwarded a letter to Mr Morris asking that Rule 3 (dealing with the inclusion of Bristol Clubs in the Association) be deleted, with a view to its being laid before the whole of the delegates, but Mr Morris had decided it would not be in order. He then continued that Mr Morris had entirely exceeded his duties in refusing to put the item on the agenda. He added that twenty years ago it had been felt there could be no harm in including Bristol clubs outside the geographical county but that the time had come when such a state of things could not continue. The report continues "Addressing the Bristol section the speaker (Mr Reakes) added "You have usurped positions in the teams that really belong to Somerset men. This feeling of exasperation cannot be allowed to continue. …If you don't take up a reasonable attitude and form an association of your own in Bristol it will mean that Somerset County will use a certain method which they do not like to adopt". Mr Morris defended himself stating that the resolution had only reached him a fortnight before the meeting, which was refuted. The President then aroused a further outburst which by suggesting that the vote at the original meeting in November had been incorrectly taken. A suggestion was put forward that a special committee of six delegates review the matter, but the representation on such a committee would have been problematic. The proposal that the formation of Bristol County, affiliated to the EBA would be a way forward but the President stated that it was impossible that Bristol "was not a geographical county and it cannot be regarded as such by the EBA." However this protracted and acrimonious AGM was concluded by agreeing that the whole matter should be put before the EBA. The outcome of the EBA meeting is not recorded in the Archives. The E.B.A. then ruled that all the Bristol Clubs situated in the geographical County of Gloucestershire could not be affiliated to the E.B.A. through the Somerset County Bowling Association. They also out the possibility of forming a City and County Bowling Association with full County status and stated that all Bristol clubs North of the River Avon had to be affiliated to the Gloucestershire Bowling Association. The next entry refers to a meeting at the Grand Hotel in Bristol on March 31st 1936. The headline reads "New Bristol Bowling Association Formed" and "35 clubs representing 1,500 players"
Clubs in RED are still in existance using their original club names. Many of the above clubs have long disappeared, some have changed their names,whilst others have amalgamated, some have added Bristol to the club name. Two other clubs, Fry's BC were represented but outside the nominated geographical region, and Master Bakers BC did not attend but sent a letter of support. It was stated that hopefully clubs in the immediate area, such as Fry's could be admitted in the future. So the Association was formed, with Alderman H.J. Maggs J.P. (Redfield BC) being elected as the first President. The first match was played at Bristol St Andrew's BC, Derby Road, on 26th. May 1936, between the Vice President's team playing the President's team, with a President's team being narrowly defeated by Clarence Davey's Vice-President's team 114-116. The afflation fee at that time was 10s6p [ten shillings and six pence] per club, and badges were sold for one shilling and six pence. The association then became affiliated as an associate member to the EBA, and the member clubs fully affiliated through their geographical counties, those north of the River Avon joining Gloucestershire. The affiliation fees were ten shillings and six pence per club and badges were sold at one shilling and six pence. 1936. Association founded with 34 member clubs. 1937. Competition fees were introduced, the fee being one shilling and sixpence per player in singles, pairs and fours, and four shilling per club in the Interclub championship. The 1937 Dinner was held at the Berkeley Café at a cost of four shillings and sixpence and the guests included the Presidents of the E.B.A., Gloucestershire and Somerset Bowling Associations. 1958. Bedminster Brotherhood and Rangers B.C. amalgamated with Bristol Omnibus B.C. C.W.S. Bowls section disbanded and they resigned from the association. Cost of handbook one shilling and sixpence. Keynsham B.C. joined the association. 1960. 45 member clubs. Entry for Clarence Davey five shillings, individual entry two shillings. Norman Aspden, secretary, passed away during the season. 1961. Harry Punchard President 1939 and 1940 passed away. Clarence Davey of Henleaze B.C. passed away. Scull B.C. joined the association. 1962. President Bill Watkinson passed away during the season, immediate past president H. Mapstone carried on for him. Past president Harry Priddy passed away. 1963. Kingswood & Hanham B.C. joined the association. 1964. Bristol Electricity B.C. joined the association. 1965. St. George Civil Defence B.C. disbanded. Kildare B.C. merged with St. Andrews Park B.C. Scull B.C. changed name to Drake & Scull B.C. Royal Commonwealth Society B.C. left association. Portishead B.C. joined the association. 1968. Courage [Western] B.C. joined the association. 1969. Brentry Hospital B.C. joined the association. Bristol St. Anne's B.C. disbanded after 60 years of bowling. Fry's [J.S. Fry and Son Ltd.] B.C. changed it's name to Fry, J.S. B.C. G.B. Britton and Son B.C. changed name to G.B. Britton B.C. Robinsons B.C. changed name to Robinsons, E.S.& A. B.C. H.C. Hayes President 1936 and 1937, our first President, passed away. 1981. St. George B.C. changed it's name to Bristol St. George B.C. Greenbank B.C. changed it's name to Bristol Greenbank B.C. 1982. Yate & District B.C. joined the association. 1983. Portishead R.B.L. B.C. joined the association. 1996. Associations Diamond Jubilee. [1936-1996].